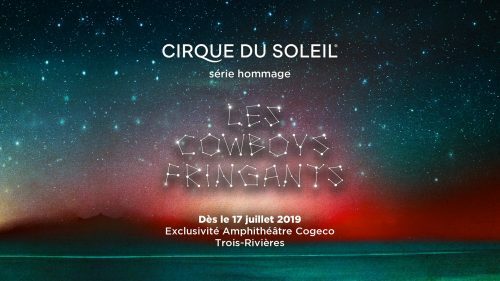 The fifth chapter of the Cirque du Soleil tribute series will celebrate the music of Les Cowboys Fringants, the popular and critically-acclaimed Quebec band who has rocked the French-speaking world for two decades. This series is presented exclusively at the Cogeco Amphitheater in Trois-Rivières. 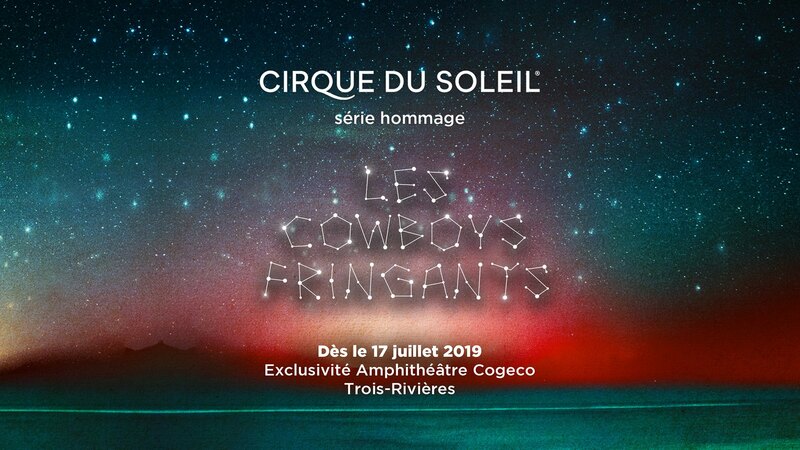 Tickets for sale on November 30th, which you can find here: https://www.cirquedusoleil.com/les-cowboys-fringants. Les Cowboys Fringants are a folk rock music group formed in 1995 in Repentigny, Quebec. They perform Québécois néo-trad music (modernized Quebec folk music with a rock flavour) and draw on country music. They have an international underground following, especially in France, French-speaking Belgium and Switzerland. Band members hail from the Montreal suburbs of Repentigny and L’Assomption. The entire band collaborates on the lyrics, although guitarist Jean-François Pauzé often contributes more than the others. Les Cowboys represent an important part of modern Québécois music. They are part of the néo-trad movement that appeared in Quebec around the turn of the 21st century, and they embody a resurgence of political songwriting (after the drought of the 1980s and parts of the 1990s, political songwriting had been a victim of Post-Referendum Syndrome). As the néo-trad movement adapts Quebec folklore into contemporary crafts, the political message of the band is a re-occurrence of 1970s chansonnier activist messages of left-wing solidarity and, recently, sovereignism, although in a more distinctly modern way. They also sometimes adopt a minimalist and dadaesque style, a trend of the Quebec music scene of the 2000s – a decade of voluntary simple yet nonetheless quite intelligent and joual lyrics, therefore subversive and akin to a sort of lyrical naïve art. (The 1970s did see the first wave of voluntary joual art, like the songs of Robert Charlebois and Aut’chose, and the plays of Michel Tremblay, although not as willingly exaggerated. This is present even more in the music of Les Trois Accords, Les Denis Drolet, and Daniel Boucher, or in “Carole”, the song by “Pépé et sa Guitare”). The usual subject matter of the group includes: environmentalism, poverty, anguish and family troubles, as well as the denouncing of consumerism, exploitation, state-controlled gambling, cynical government attitude and political apathy. While some of those subjects are serious in appearance, they are often treated in a light manner, sometimes even in a fun, amusing and ironic way. The band also deals with themes of Quebec history, Quebec independence, suburban life, childhood and adolescence, kitsch, relationships and sports. Their songwriting is renowned for having woven an elaborate tapestry of fictional characters with interpersonal relationships, and sometimes a number of these characters appear in more than one song. Much like their writing, the clothes of the male members of the band are quite unique, sometimes purposely normal or kitsch and something of a postmodern, second degree artistic statement. The band themselves are noted fans of Passe-Partout composer Pierre F. Brault and have performed shows in his honour. They have also been influenced by French singer Renaud, and his songs with political messages and local popular language (for Renaud, the French argot). Many of the idiosyncrasies of their music stem from Marie-Annick Lépine, a versatile musician, who makes the band line-up distinct from the conventional guitar-bass-drums-singer. Her talents contribute to the vivacious sounds of instruments like the violin, mandolin and accordion. She has also worked on the Dumas album Le cours des jours.